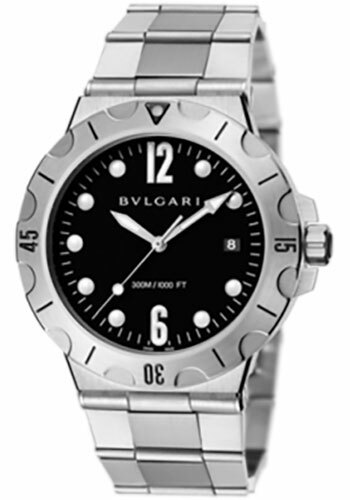 41mm stainless steel case, back revealing movement decorated with côtes de genève, chamfering and snailed finishing, black dial decorated with hand-applied indexes, BVL 191 automatic movement with date, hour minute, seconds functions, approximately 42 hours of power reserve, stainless steel bracelet. Water resistant to 300m. 41mm stainless steel case, back revealing movement decorated with côtes de genève, chamfering and snailed finishing, black dial decorated with hand-applied indexes, BVL 191 automatic movement with date, hour minute, seconds functions, approximately 42 hours of power reserve, rubber strap, ardillon buckle. Water resistant to 300m. 41mm stainless steel case, back revealing movement decorated with côtes de genève, chamfering and snailed finishing, blue dial decorated with hand-applied indexes, BVL 191 automatic movement with date, hour minute, seconds functions, approximately 42 hours of power reserve, rubber strap, ardillon buckle. Water resistant to 300m.